Rebranding a business is not an easy task, especially when it's your own. Our original name Social CRM Hub was intended to be a temporary one. It reflected the problem we were trying to solve at that point. And as with a lot of things with your own business, there always seemed to be more important things to resolve. About 18 months ago, we finally started thinking about changing it. But it took us another 15 months to come up with that name. So what prompted us to start the process in earnest? The simple answer is comprehension. The feedback we were getting was that our brand did not say anything about us. Side note: we met Joe Hockey in New York and he thought we were something to do with Rugby!?!? But once people understood our goals, they were blown away by our ambition and insight. Another big factor in rebranding is global recognition. After our recent US Accelerator trip, we have been focused on pushing into the US Market. This means we need to be a brand that will resonate with US Businesses. And this is where this article begins. It is the first step in a 4 article series. And make sure to check out the blooper reel of the names that didn't make it. As with any project of this type, you need to come up with some core requirements. There is a whole mountain of blogs and articles out there on this. We were also lucky enough to have Glen Barry, who is a very experienced branding consultant, helping us out. He's also now an advisor on the Metigy board. He'd fallen for our objectives and the problem we are working to solve, on the recent US Advance Accelerator trip we did together. There are companies in our space that everyone knows, and we intend to be the next one of those. Examples of the tools people think of for social Media content management are Hootsuite, Percolate and Buffer. Our first, and most obvious, was that the name had to be unique. There are a few reasons for this, but one of the core ones is to avoid litigation. This is a continual risk once you hit a scale, especially pushing into the US market. Next, we wanted something that we can really own. Much like Google is now synonymous with searching the internet, we wanted the same for AI Marketing. Which also means it should be short, easy to say, memorable and the domain available. This is where it gets really, really hard! Try to think of 5 to 7 letter names and then google them. There are actually tools out there to help with this. They will make you sad when you see what isn't available. And let's not forget that in the age of Social Media, it needs to be available on Facebook, Twitter, Pinterest, LinkedIn and others. It never ends. Side note: We got all but one of them. Hooray! Finally, if possible, have some actual meaning. E.g. Not just random letters strung together. But actually something with meaning. Much like Google is based on the mathematical term, the googolplex. How did we approach naming? First, in the spirit of openness and transparency - which is one of our core values - we asked the team for rebranding suggestions. Everyone jumped on it and came back with suggestions all based on varying focuses on the business. Unfortunately, the most popular ones were generally not available or just made no sense - just being transparent. Next up we tried dictionary and thesaurus attacks - the best way to describe it. You will be amazed how much you can learn from reading a thesaurus! And some of the associated words were fascinating. But again, availability became the issue. We tried things. Like objects, pretty things, smart things, number things, funny shaped things. Anything (see what I did there). Hard to spell - If you can't spell it, how can you find or remember it? Forgettable - What were we talking about? Ultimately we think we nailed the first hurdle in coming up with the brand name of Metigy. You can read more about the actual name in David's great article, "YOUR BRAND SHOULD REFLECT YOUR VISION! @METIGY". The long and the short of it is that we loved Metis, the Greek goddess of Wisdom and Deep Thought. 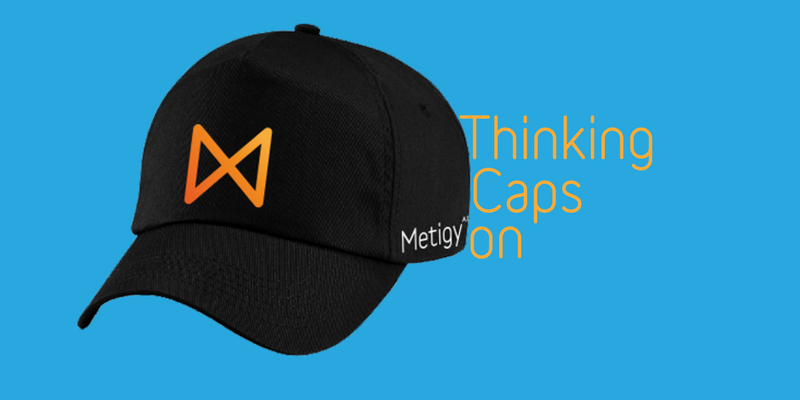 Combined with technology and strategy we got Metigy. And we are stoked with it! The response to the new name has been overwhelmingly positive from everyone! And Glen loved the name before we even got into naming it. We can really own the name and are already making a dent in the SEO space around AI Tailored Marketing and Metigy. In the next article, we'll be discussing how we created the identity. Anyone that reads anything I write knows that I like to be a bit light-hearted in things. So in the spirit of that, here is our "blooper reel". hopefully, some of these will me you chuckle.